･In this DVD lesson the basic styles of fingerpicking and country blues are explained through some examples, so even beginners understand them easily. Though this is for beginners, a variety of styles and techniques are featured, and its contents are so deep. Detailed and careful explanation / 95 minutes solid contens! With 56 page complete tab/music booklet! ･"Ragtime" is by nature melodious and nostalgic black piano music which was very popular from the end of 19th century to the early of 20th century. Also in acoustic guitar scene, it has uniquely developed as "ragtime guitar" which is based on its sounds and approaches. And today it has been established as fingerpicking solo music on solo guitar. 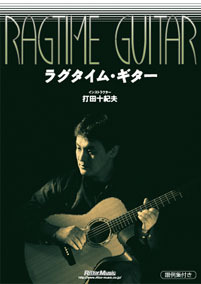 ･In this DVD, the styles of such "ragtime guitar" are classified into three section; <Folk Rags> where the traditional folk songs are featured, <Ragtime Blues> for which the country bluesmen's ideas are used and <Classic Rags> where the melodies of piano rags are arranged for acoustic guitar, and you'll learn the characteristic tunes in each of them. Though a lot of complected techniques are featured, you'll be able to master surely by trying them step by step. When you can play "The Entertainer", you will be just an entertainer!! ･Will The Circle Be Unbroken?